Aurora Expeditions' Akademik Shokalskiy has become the first ship to sail into Commonwealth Bay this Antarctic season, making it within 10 nautical miles of Mawson's Hut to commemorate Sir Douglas Mawson's arrival 100 years ago. The ship sailed into the bay on the evening of 10 January 2012, just two days after the estimated centenary of Mawson's landing in 1912. Expedition Leader, Roger Kirkwood, says he is thrilled at being able to get this close to Mawson's Hut with the current ice conditions, noting the superior navigating skills of his highly experienced Russian Captain and his crew. "The expedition team and all of our 48 passengers are ecstatic that we have actually arrived to celebrate and pay tribute to our Antarctic hero. It has been an amazing feat to finally reach Commonwealth Bay, but we did it! "Our landing in Commonwealth Bay was simply magical. Our passengers went trekking over the ice, scattered with Adelie penguins, under a clear blue sky and no wind. The Antarctic Plateau and Cape Denison, the home of Mawson's Huts, were both within sight. Certainly an experience of a lifetime!" Access to the region has until now been block by fast ice and a 150 kilometre iceberg, known as B9B. "We were hoping the previous few days of blizzard conditions, which dogged our passage in, would have shifted the fast-ice (ice still attached to the land), so we could make it all the way to Mawson's Hut. Unfortunately the ice is still too thick to make it all the way in. " said Roger. 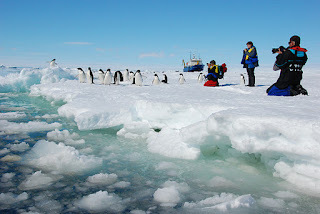 Other highlights of the commemorative Antarctic expedition so far have included a three kilometre walk out over the fast ice to a grounded, cavernous iceberg, Zodiac cruising around the enormous, 150 kilometre long, 30 metre high, walls of the B9B iceberg, and watching hundreds of inquisitive and charismatic Adelie penguins playing on the ice. Aurora Expeditions is an Australian-owned and operated expedition cruise company who have been operating expeditions to Antarctica for two decades. This season they will run three commemorative voyages to East Antarctica to celebrate the Mawson Centenary, as well as 10 voyages exploring the Antarctic Peninsula from Argentina. Their 2012/13 Antarctic brochure is now available online at www.auroraexpeditions.com.au or call +61 2 9252 1033 to order a copy. Roger Kirkwood is a research scientist at the Phillip Island Nature Parks in Victoria, where he mainly studies the seals and seabirds of southern Australia. He has led over 100 research trips to offshore islands and published over 100 research and public articles, chapters and several books. Visiting Antarctica almost every year since 1984, he has worked for the Australian Antarctic Division and has worked over 10 seasons as a naturalist and expedition leader with Aurora Expeditions.